Amazing mural artist Mona Caron has created a number of wall-sized paintings in San Francisco. 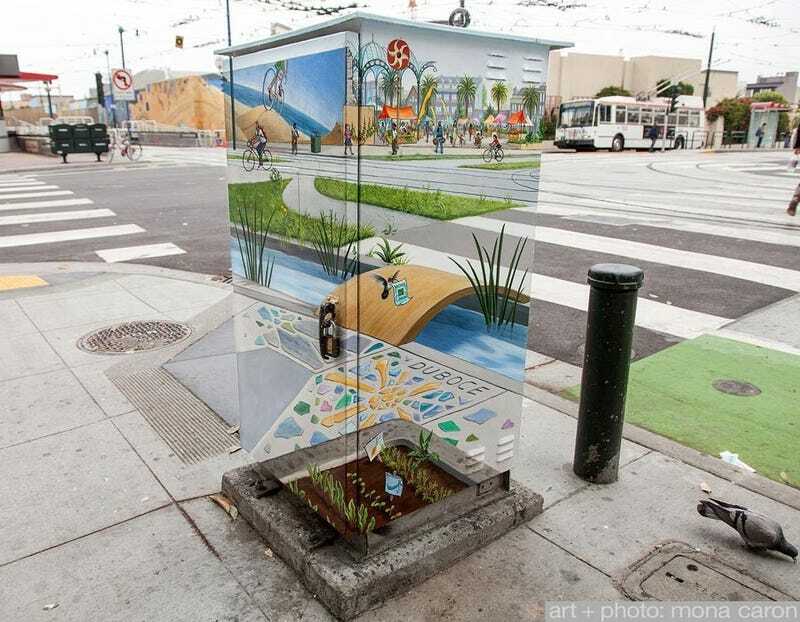 But this painted utility box is one of her standout works — and it's a great optical illusion, too. There are two incredible things about this work. One, it allows you to glimpse the intersection of Duboce and Church as it might look in a more Utopian, greener San Francisco. (This is a theme in a lot of Caron's work, and she's created other murals showing her future vision of San Francisco.) And two, it blends seamlessly into another one of Caron's murals, the Duboce Bikeway Mural, painted along the train tracks that you can see in the background. So meta!